Home > What are Southern wetland forests worth? You can’t put a price tag on clean air and water, protection from storms and flooding, or the way you feel when you’re in a wetland forest. But we knew that there was a real dollar value to all the services our forests provide, so we started digging. We considered things like water filtration, tourism, protection from extreme weather events, wood products, and food. 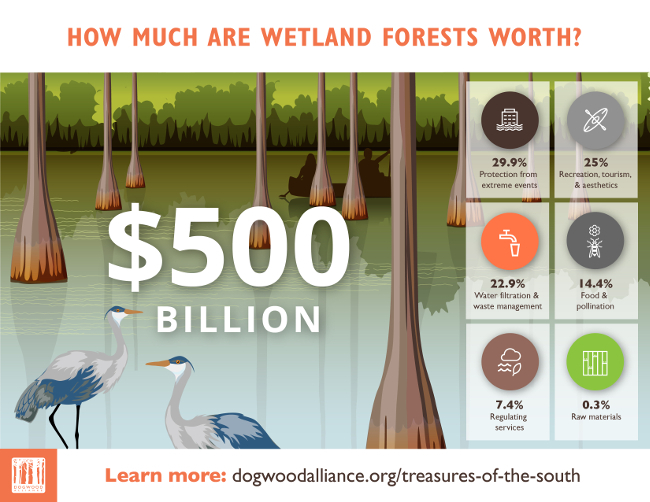 Through exhaustive research, we found startling truths about how much our standing wetland forests are worth to Southern states and communities. Our Southern wetland forests are worth more than $500 BILLION. Logging contributes just 0.3% to that $500 billion. In fact, we discovered that wetland forests are worth FIFTEEN TIMES MORE standing than logged. No matter what the logging industry says, we’ve proven that standing wetland forests keep jobs and wealth in their states and communities in a way logging never will. Despite their life-changing and life-saving qualities, fewer than 10% of wetland forests in the US South are protected from logging, agriculture, and development. Sadly, up to 80% of these forests have disappeared across the South. By the time recovery efforts are complete for 2017’s hurricanes Harvey and Irma, each are expected to cost over $100 billion in damages. Imagine how much worse those damages would have been without those wetland forests absorbing and slowing the flood tides. Imagine how much more these amazing forests could do for us if there were more of them. If we don’t choose to invest in Southern wetland forests, we are hurting Southern families and communities. We’d be taking away their ability to thrive economically in a changing climate. We need to make a commitment to restore these forests. We need to put people to work on restoration, management, and ecotourism. 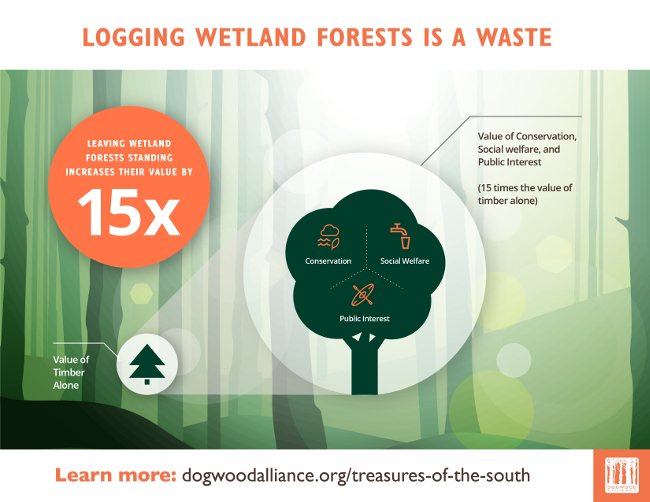 When we change the way we value Southern wetland forests, only then will we be able to see all the true benefits and wealth they provide us. Tell your governor to invest in your state’s wetland forests today. Step up your commitment to forests by joining the ranks of Forest Defenders!